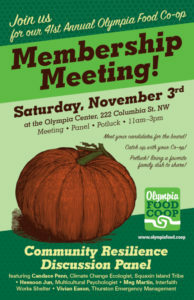 membership meeting saturday november 3rd! Catch up with the news from our Board of Directors, committees, staff members, and our Board candidates. Participate in a member question and answer session, and engage with a panel discussion. Enjoy foods from our local vendors, and bring a dish to share!